Canada's Okanagan Valley is a large and varied wine region; still slightly mysterious even to those most ardent Northwest wine fans because of what's known casually as a "national border" and Canada's very tough wine regulations. I first came to appreciate the wines of the Okanagan as a result of beautiful fruit forward examples of Pinot Noir, crafted in a cool climate style. My appreciation grew when I stumbled across some aromatic whites; the kinds of white wines and varietals you'd associate with Germany or Northern Italy's Friuli or Alto-Adige. My mind was made up by these examples, the Okanagan is a cool climate region producing delicate beauty, aromatics and acidity that craft perfect food wines. As it turns out, the Okanagan has a fair bit of climate variability. Its cooler regions, those to the North of the Valley near Kelowna and the middle of the valley around Penticton produce nice examples of cooler climate wines. The Valley, however, dips all the way south to the Washington state border where we find Oosyoos, which favors warmer climes. 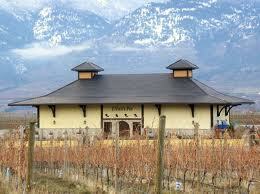 Le Vieux Pin, or the The Old Pine is located in this area of South Okanagan, where the weather is significantly warmer. When I mentioned to Rasoul Salehi, General Manager for Le Vieux Pin, that I was sorry to see they were discontinuing the production of Pinot Noir, Rasoul explained that while the Okanagan is a young growing region they're already learning some lessons and one of those is that the Pinots and Gamays that have found success to the North do not work in the Oosyoos because of the warmer weather. "As a young wine region with a lack of experience, tradition or know how, trial and error has been key," he says, "After four to five vintages of dedicated experimentation we are finding our focus." For Le Vieux Pin, that focus is on Rhone varietals, though the later ripening Mouvedre and Grenache are not a match for the climate, and the white varietals Marsanne, Roussanne and Viognier. What the Okanagan lacks in experience or tradition, it makes up for in spirited youth and "Wild West" attitude. There is a balance, an homage, and an appreciation for the work done in the Old World, and even successfully here in North America. In many ways, there is also a relief from the constraints of tradition and the controls of AOCs. Le Vieux Pin is about that open-minded and experimental approach, learning by doing and in so doing learning to make the best wines the Okanangan will grant them. Le Vieux Pin is taking its inspiration from the Rhone and from French tradition. They're also pushing boundaries for the Okanagan and they've found their customers and fans to be educated about wine and they're looking to Le Vieux Pin among others to push the envelope for BC and Canadian wine. Le Vieux Pin, in turn, is happy to be working amidst such a strong wine culture in the South Okangan and they're grateful for the restaurant, wine bar and sommelier scene that continue to do the work of educating and inspiring Canada's wine scene. I had the pleasure of trying their 2009 Roussanne/Viognier blend. The aromatics are light and lively suggesting fruit and floral components. The wine has lychee, lemon peel and honeysuckle aromas and delivers on ample acidity while also carrying through a fair amount of rounded mouth-feel. This wine is an undeniably outstanding example of a white Rhone style blend. The mouthfeel and acidity are dialed in to a tee. The folks at Le Vieux Pin are making wines worth taking note of should you find yourself north of the border.